Happy Valentine’s Day! Since it’s raining, we have some time to work on pictures (deleting many) and post some on the blog. 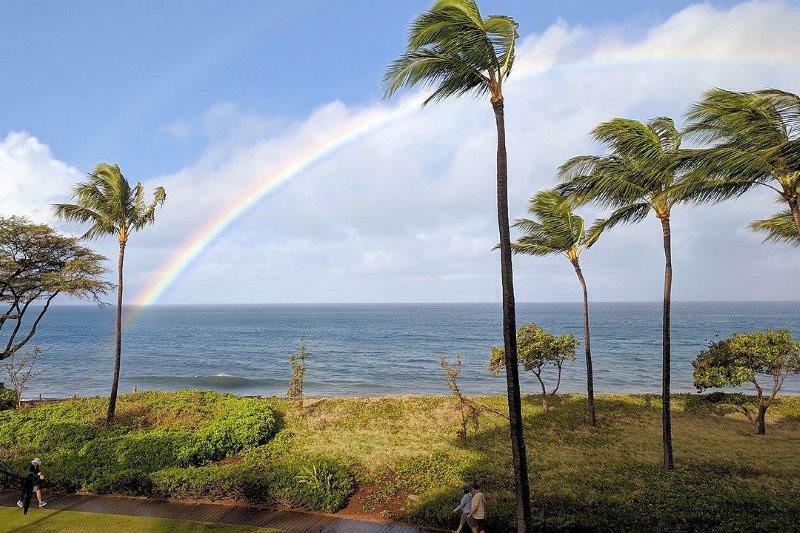 Maui is always good in February – no snow to shovel – but it’s been a wild weather two weeks, so far. 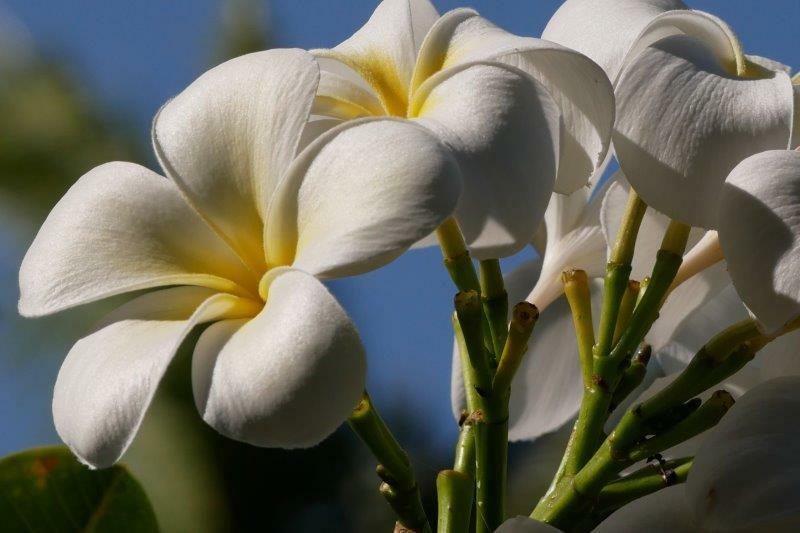 If one of these weeks was your only week in Hawaii, you would not be happy! We’ve noticed, though, that rain does not keep children from the pool. The rainbow greeted us this morning for Valentine’s Day. You can see the wet boardwalk at the bottom of the picture. It’s been raining for the past few hours which is why there’s a new blog post! A huge winter storm ran over Hawaii this week bringing heavy winds, big surf and rain. 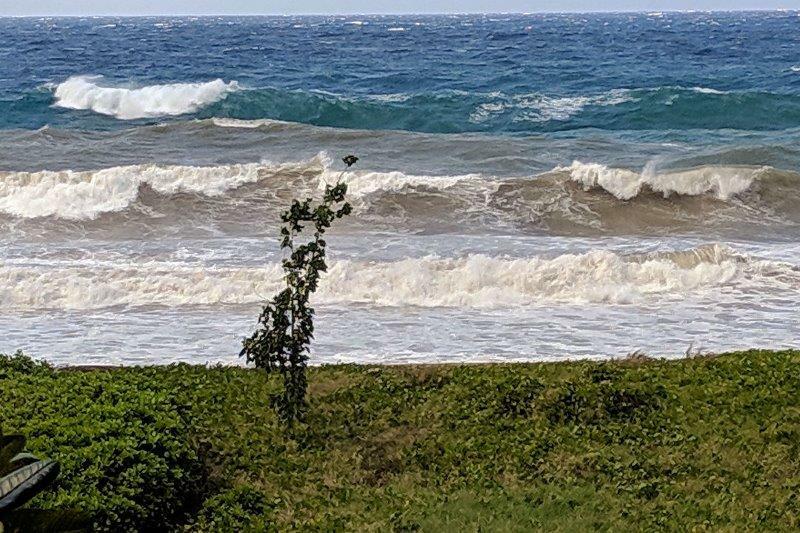 The west shore of Maui, where we are, didn’t get huge waves like the North Shore of Oahu but we had a prime view of 5 and 6 waves lined up at a time waiting to break on shore. This wave pattern was caused by two wave patterns colliding or so the weather people reported. 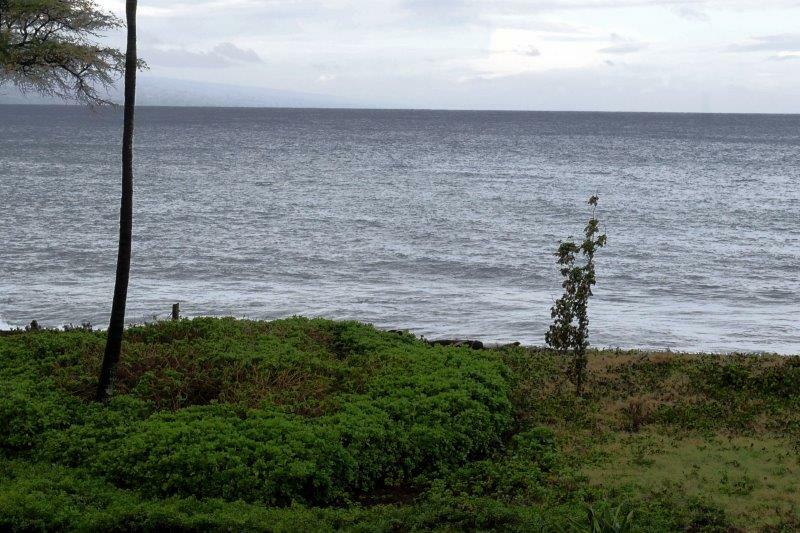 The wave report said these colliding patterns also kept the waves on Maui pretty small. Normally, waves are pretty mild around here and come only one at a time. This is what the water normally looks like around here. My birthday was the day of the storm. 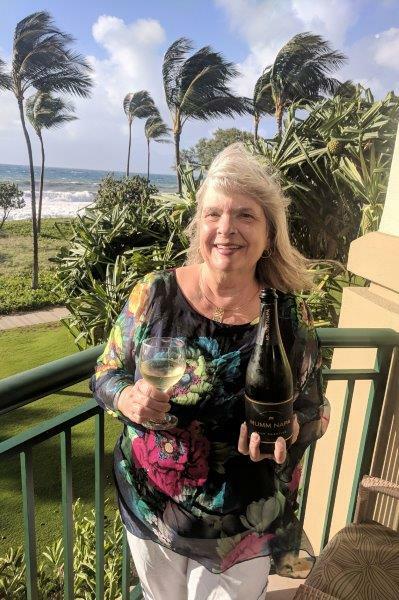 I had some champagne while trying to capture the waves in pictures but the wind was blowing too hard to venture out to the beach, some of which was washed away by the storm. The wind blew popcorn out of a bowl I had on the porch so I held onto the champagne tightly! The birds enjoyed the lose popcorn. My birthday cake at Hula Grill, an outdoor restaurant on the beach. They had to put down the canvas sides and even that didn’t block all the wind. We highly recommend it for dinner. 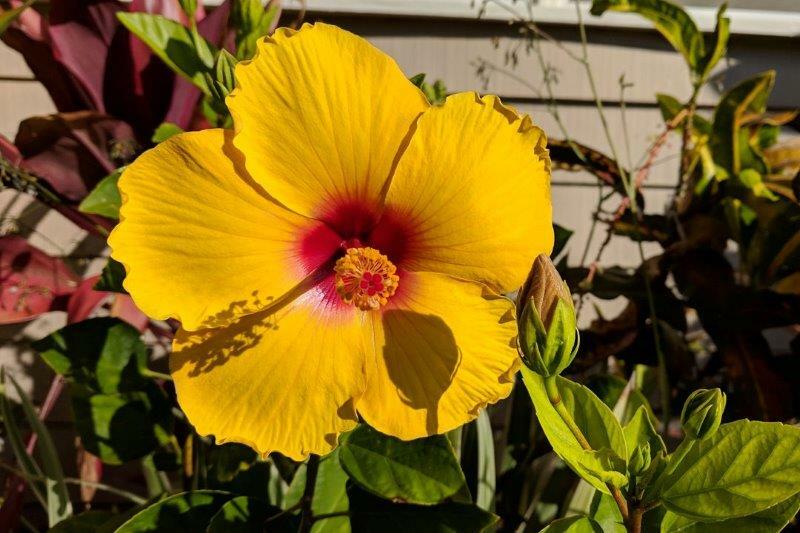 The hibiscus are in full bloom so I have to take pictures of them! 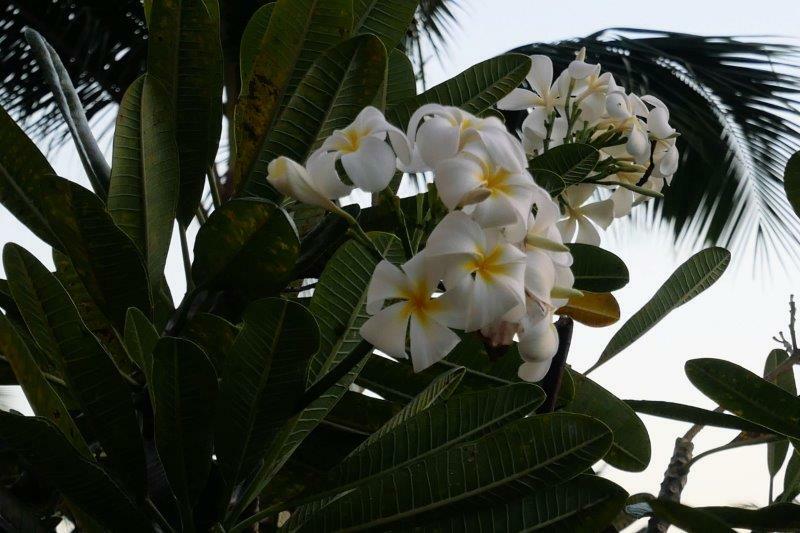 These plumeria (my favorite) were on a tree by our balcony. The storm blew them all away! 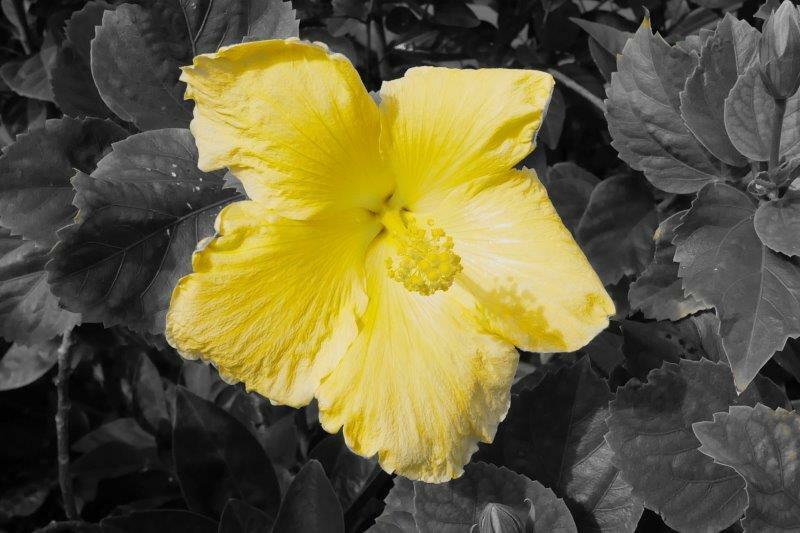 Yellow hibiscus in full bloom. When the rain falls, you have time to play around with photo editing software. There can never be too many sunset pictures! 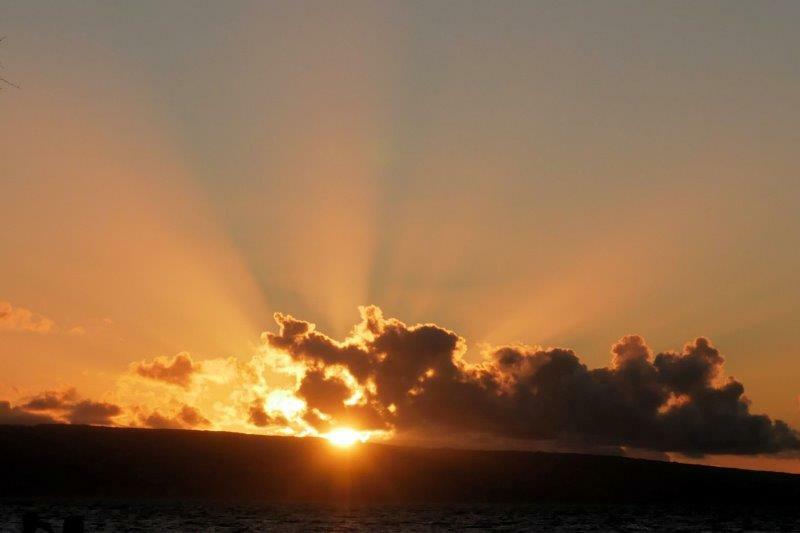 The sun setting behind Lanai. We’re off on our next adventure! 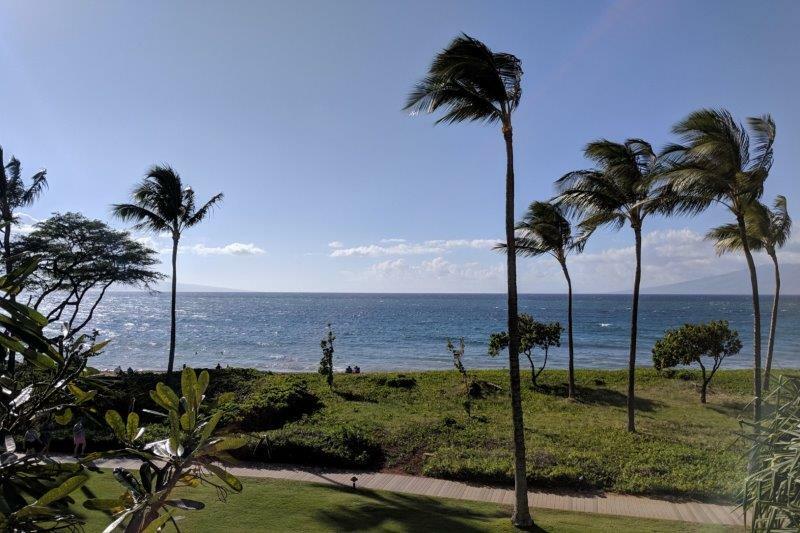 It’s actually a pretty mild adventure – a month on Maui to escape cold weather and snow in Colorado although Winter had actually been pretty easy in Fort Collins when we left. This week the temps hit -5F for a few mornings in FC. It’s days like this I really enjoy retirement – no 8 AM classes to get to! The flight over was very uneventful – left on time, arrived 45 minutes early to not have a gate available until the American flight finally left the gate! We picked up the car, made a Costco stop for groceries, and headed off to Kaanapali. For a Friday evening, the drive was easy with no traffic jams and a gorgeous sunset. 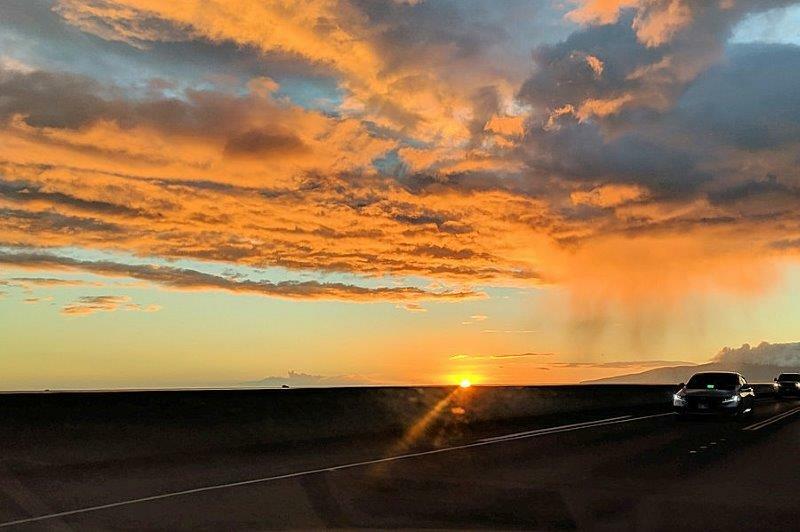 Sunset was gorgeous driving from the Kahalui airport over to Kaanapali. And the traffic was light! Saturday was rainy off and on, but we picked up the rest of the groceries and returned the car to Avis. We only rent a car for a day and then just use the shuttle or walk for the rest of the trip. Here’s where the icemaker story starts. We thought we’d dropped an ice cube on the floor, resulting in a small puddle as it melted. We dried the floor and headed to bed. When I woke up in the middle of the night and walked to the toilet, I realized we had a bigger problem when my feet got wet! We called maintenance on Super Bowl Sunday and Richard magically appeared to fix the leaky icemaker. That fix lasted for 26 hours when the leak reappeared on Monday afternoon, bigger and wetter! Visit number 2 from maintenance and another fix. Now it’s Tuesday afternoon when water once again made its way under the fridge and across the floor. Visit number 3 from Maintenance involved Richard from visit number 1 along with his supervisor. Take the entire ice maker apart, install new parts, add a part … OK … it should all work now! We walked to the beach to watch sunset just to find MORE water on the floor when we returned to the room, resulting in call number 4 to maintenance! This time, no fix to the ice maker! They brought an entirely new fridge to the room! We hoped try number 4 would be the magic one so we can make ice for our gin and tonics and not find water on the floor! 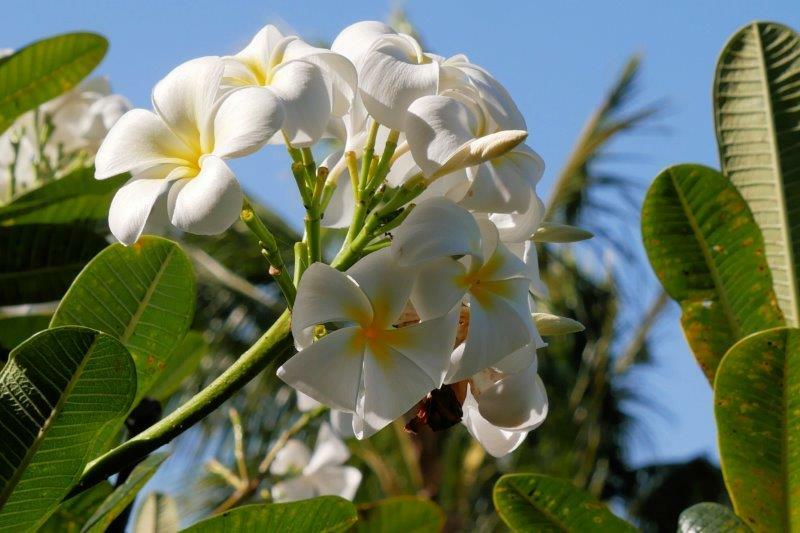 Plumeria in its natural environment – my favorite! 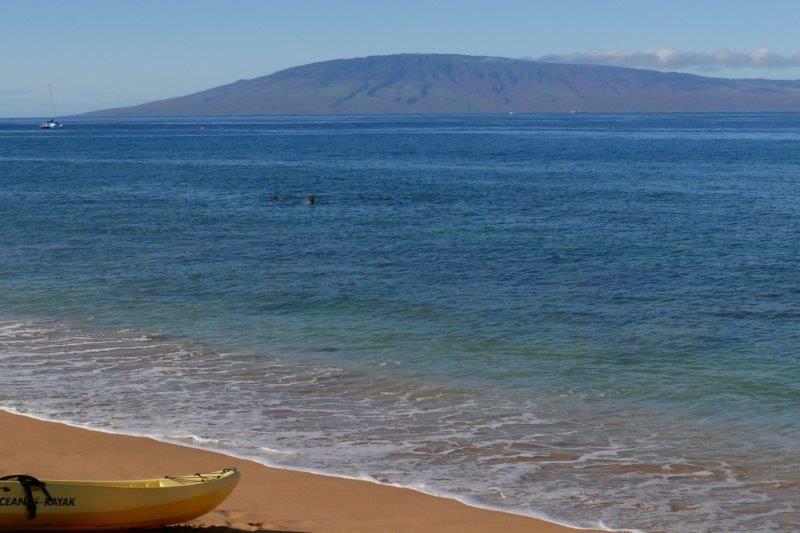 The island of Lanai across the water. It has a nice State Park for snorkeling. This is whale migration season but none of them chose to make an appearance in my picture. Update to the icemaker… the new fridge works great and we have plenty of ice. The wind is blowing today. 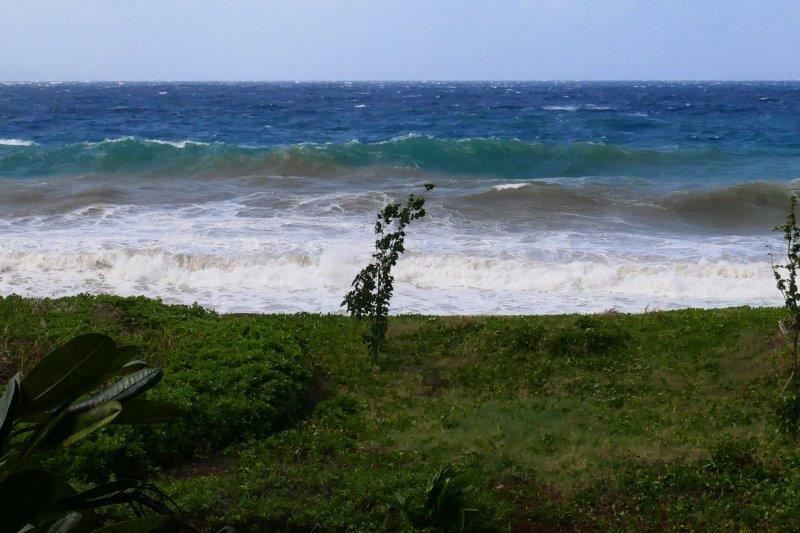 The North Shore of Oahu is expecting 40-60 foot waves and road flooding! No big waves here since we face the wrong way. We’re starting week 2. Here are a few sunsets we captured last week. 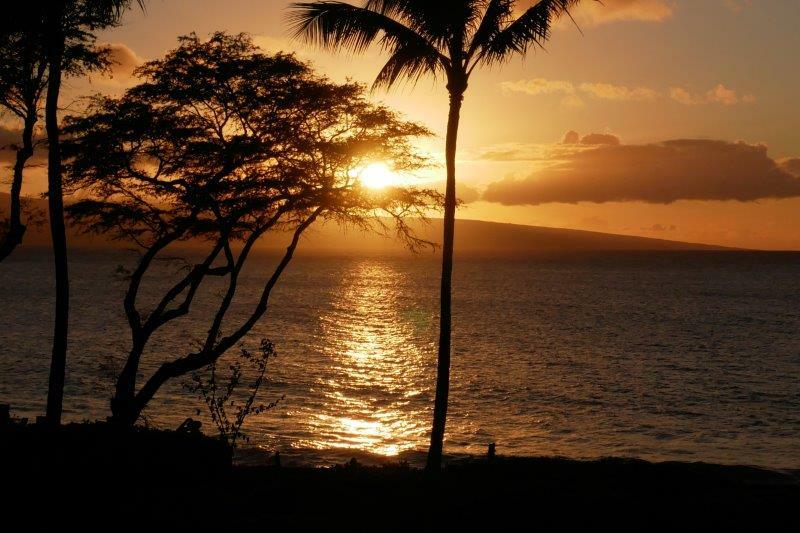 Sunsets are a beautiful part of Maui since where we stay faces west looking at Lanai and Molokai islands. 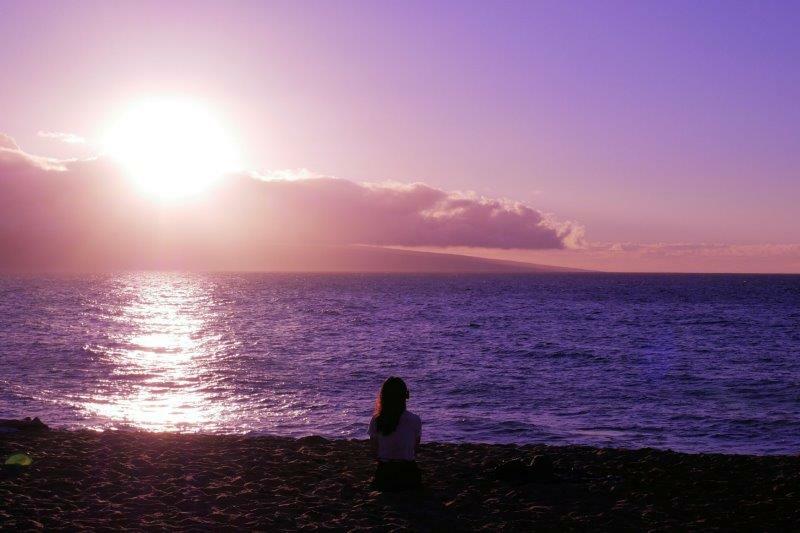 A purple sunset with the help of the camera! 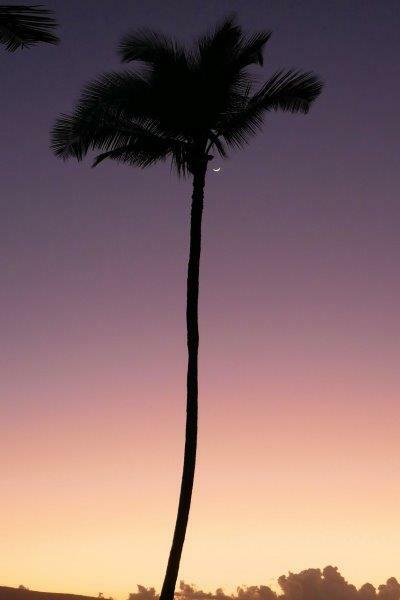 The new moon shining in a clear sky. The ship arrived on time in Honolulu about 7 AM and our flight from Honolulu to Maui was booked for 12:15 PM. Everyone on the ship had to clear US immigration before they could go ashore in Honolulu and clearance was to be held in the theatre. What would you think when you hear “immigration, customs, and 1900 passengers” all in the same sentence?? Given how long it can take to clear immigration at an airport, we were prepared for the worst! They made no differentiation between passengers disembarking for good and passengers just going ashore for the day. Total time – 8 minutes from the start of the line to the end! Note: International visitors took longer – about 45 minutes. Hey! We had time for a quick breakfast before we picked up our hand luggage in the room, left the ship, walked through a warehouse, turned right and found our suitcases sitting in the Pink group! Holland America gave the disembarking passengers (us) the standard Customs cards the night before. What would you think? Somewhere we’ll have to go through Customs, right? Wrong! We picked up the bags and walked out the door, across the street and took a taxi to the airport. Mark’s comment about Customs – “This would have been the time to bring back a $20,000 watch”. Next stop was Maui. The flight landed on time, we made a Costco and Safeway stop, and checked into the Condo for 2 weeks. Maui was incredibly green thanks to all the rain they had this winter. 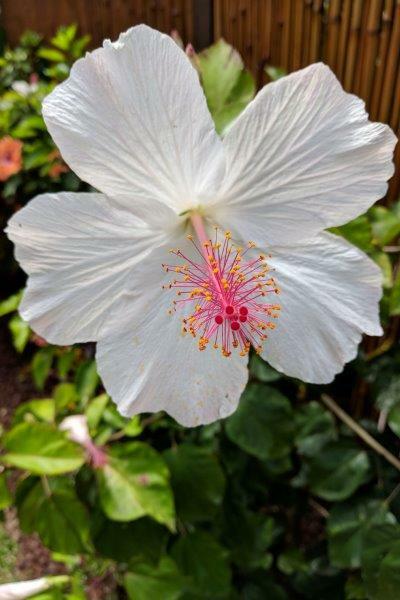 Pink and white hibiscus was one of the beautiful flowers we saw on Maui. 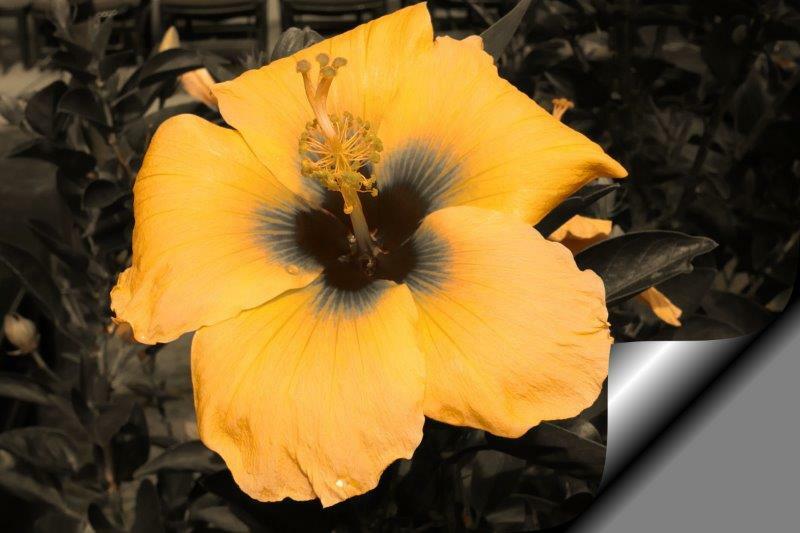 Maui had lots of rain this year and flowers were bigger than we’ve seen on past visits. 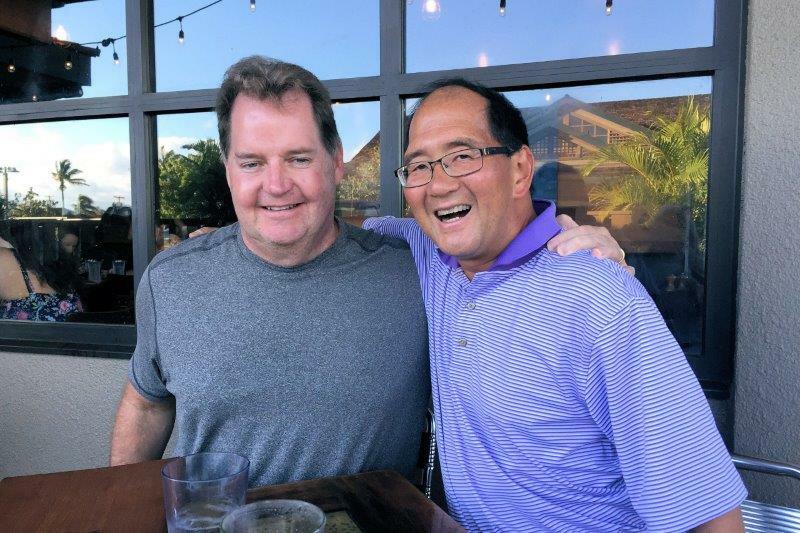 Mark met Seattle Bob at the grills one night. Seattle Bob asked if we like ahi and snapper because a friend with a fleet of fishing boats sent over several BIG packages of fresh frozen fish and it was too much for them to eat. We love fish, thank heavens, since we ate fish for 5 straight days before we took a pizza break. 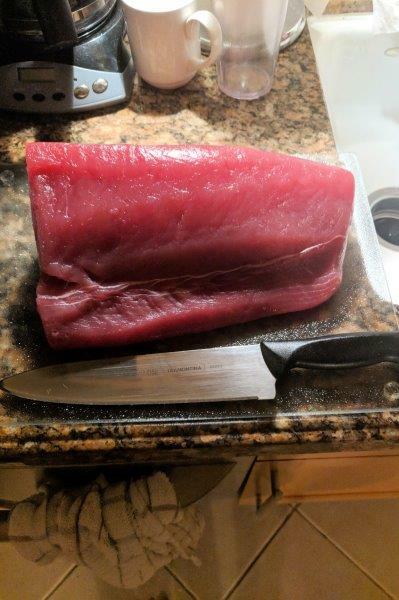 A BIG chunk of ahi to be grilled! 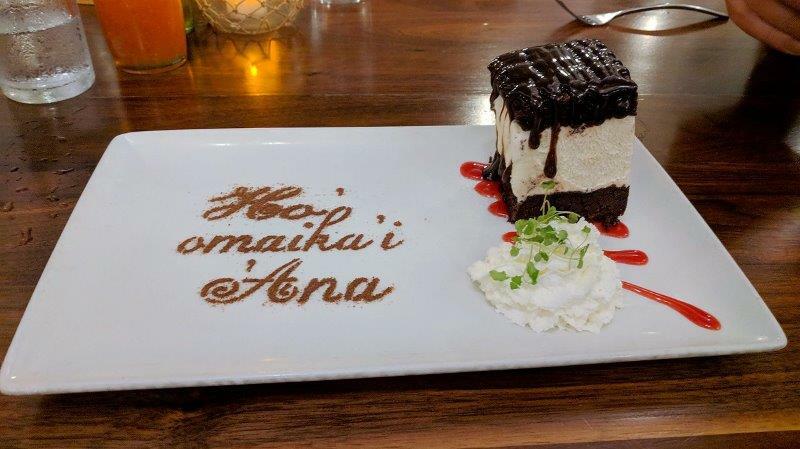 It was Iowa week in Maui. Iowans are everywhere and Maui is no exception. Two guys Mark has known since freshman year were in Maui! Another U. of Iowa connection. 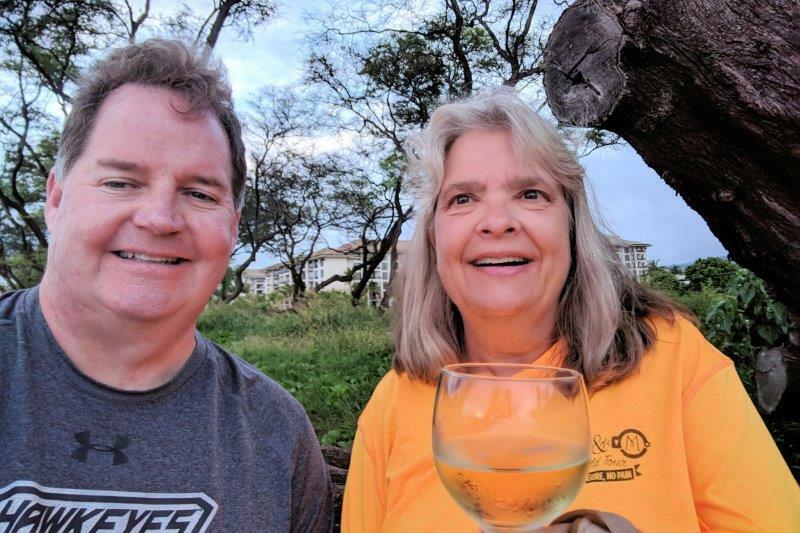 Dale and Sue just happened to be in Maui for a week at the same place we stayed. Chris lives on Maui. He and Mark have known each other since freshman year at Iowa. 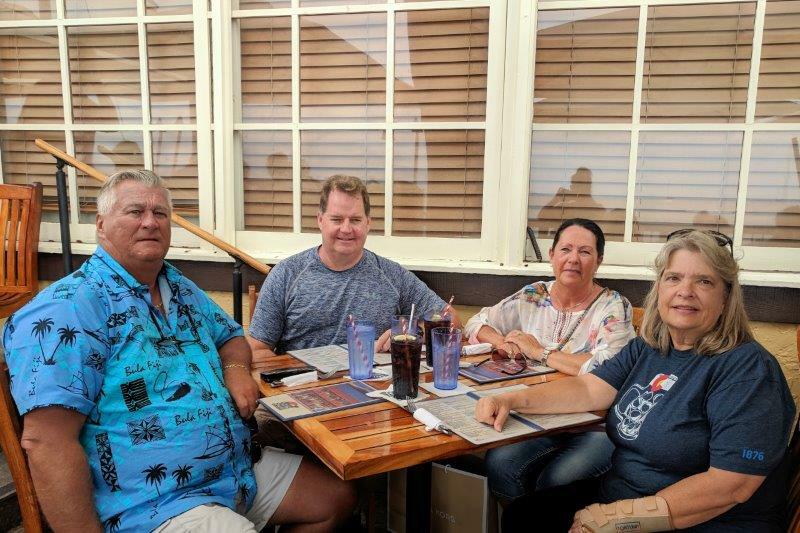 Lunch in Lahaina with 2 Norwegian friends we met on the cruise. We disembarked in Honolulu and flew to Maui but the ship went on to Maui in 2 days. At the end of 3 weeks we flew back to Denver! Home again after 263 days! 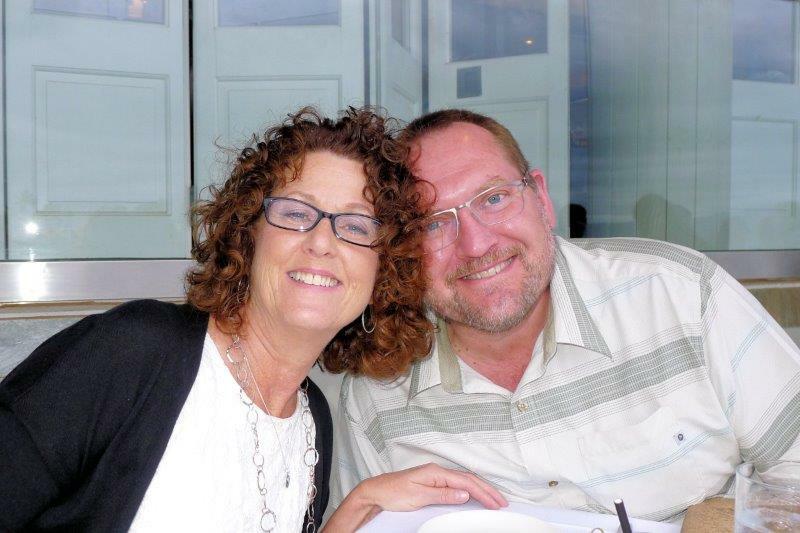 Retired couple Mark and Susan are wandering the world and reporting on their adventures. We are not backpackers nor luxury travelers but are visiting places we've always wanted to see.